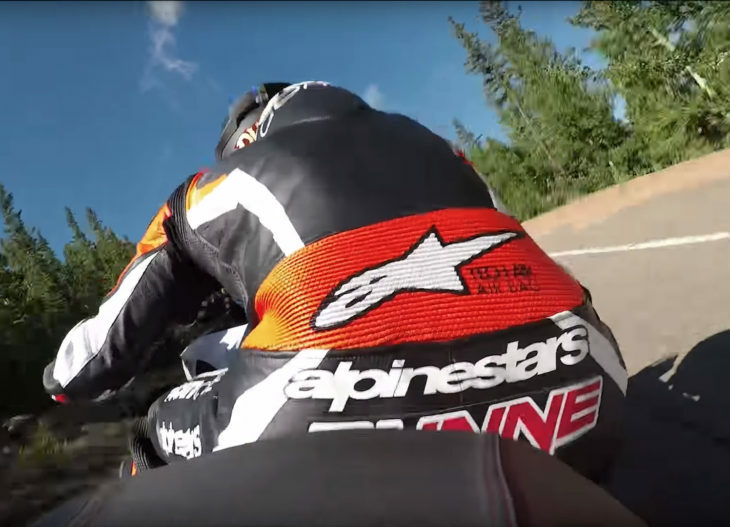 The heavyweight motorcycle division competing in the Pikes Peak International Hill Climb event just a few days ago resulted in a narrow victory (less than one second) by Ducati’s Carlin Dunne over KTM’s Rennie Scaysbrook (a Cycle News editor). You can find full results (motorcycles included) here. Dunne took his Multistrada 1260 Pikes Peak machine up the treacherous course with two video cameras onboard, and we offer both videos below. Note the lean angles, and how close Dunne appears to get his elbow on the tarmac (particularly, on the right side). These guys aren’t messing around! Dude’s got balls, for sure. I wouldn’t dare ride a Fuglystrada out in public. Those are awesome videos. Watch the bottom one first (has his interview about the run). It almost looks smooth as it is nothing but road from the front. Top video is a camera on the back of the bike and shows how hard he has to work to stay in control! So bumpy, almost thrown off in a couple spots! The top of the course is the most insane with no gaurdrails in some corners, nothing but blue sky ahead! This is eye-opening stuff. He got fairly loose, it looked like, several times there. Big-time pucker factor, but always back on the gas. Strong riding (though I was rooting for Rennie). I forget the reason for the requirement of one-piece handlebars – was there a safety issue at some point (equipment failure)? In any event, I wouldn’t bet a 1000cc inline four race-replica would beat these big bore v-twins up this particular road. The big-time torque out of the turns and wide handlebars (some of that looked a bit moto-y!) would be hard to beat on this mountain road. Makes me want to go ride that road sometime. The Hill Climb experienced a motorcycle rider death two years in a row. Both guys were riding sport bikes, so the board of directors decided to do away with them. The experienced racers criticized the new rule because the dedicated sport bikes, as would be expected, are the best handling. The road is insane. It is almost surreal to watch bikes and cars attack it with such speed. Very high penalty for failure just about everywhere along the route. It’s an amazing road for sure, race footage is surreal indeed. Thanks, I didn’t know that about the rules. Gives me a whole new interest in this race using production machines. Plus I love real handlebars. I have to have tapered bars on all my bikes. Even have them on my bicycle! Now that was cool! MAP sensor is gotta be wondering what the heck is going on! Oh my, does the occasional deer or other animal ever wander across this road? Crazy. Not quite Isle of Man crazy, but crazy. I wonder when somebody will get a Kawasaki H2 with it’s super charger up on that hill. I’d think pressure boosting would be a big advantage up there. To race Pikes Peak the motorcycle must have handlebars, not clip ons. Sorry, no H2. Didn’t know that, but I guess it explains the bikes that they usually choose. No conversions? Seems like that’d be an easy enough work around. The bike has to be sold stock with handlebars. There is a prototype class, but I don’t think you can convert production machinery even in that class.